Veterans Kanektok River Fly-Fishing Expedition. 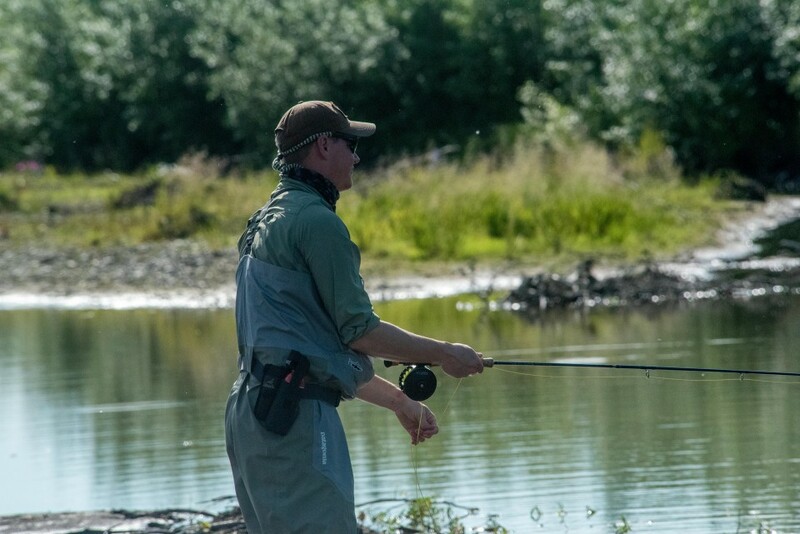 The Season opens with 100 miles of Rainbow, Char, Sockeye, Grayling, Wildlife and Camaraderie. The mountain passes through the Wood River and Ahklun ranges are fully obscured in fog and rain showers. We have assembled a team of 7 Veterans whose military service spans from Viet Nam to Afghanistan and Iraq in Dillingham, Alaska. We waited for a break in the weather and meanwhile worked on knot tying skills and practiced our fly-casting at Lake Aleknagek. The Barometer was 29.75 and falling so we had inkling we’d be weathered in for a while. Spirits were high and someone summed up our status in a warm house, on a lovely lake by saying. “We are safe here. We won’t pressure the pilots to fly into harms way in a storm, and No One is Shooting at us!” We dined on King Salmon and pasta and enjoyed each other’s company. The following day was much the same. The barometer fell until noon and then the veil of mist which obscured Sunshine pass began to thin and portions of ridges came into view. improve hour by hour. 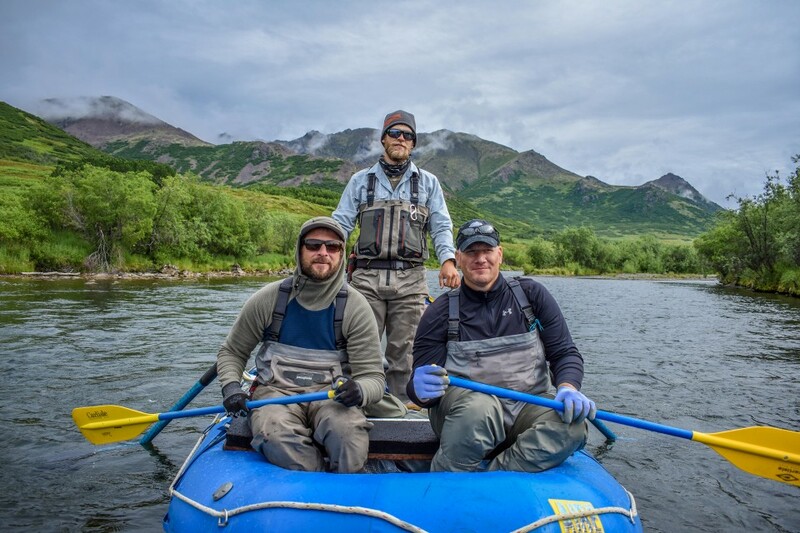 Nathan Ward, a documentary filmmaker accompanying the Vets landed a nice Sockeye on the fly in the Wood River. Combat and military service stories were shared and compared but there was never bragging. Some of these men had fought at very close quarters with their enemies while others had been the targets of IED and Mortar attacks. Most had suffered the physical and psychological injuries from their various traumas. All were keen to begin the Kanektok adventure and all had prior Military Service experience with “hurry up and wait” on the tarmac for aircraft to deploy them. 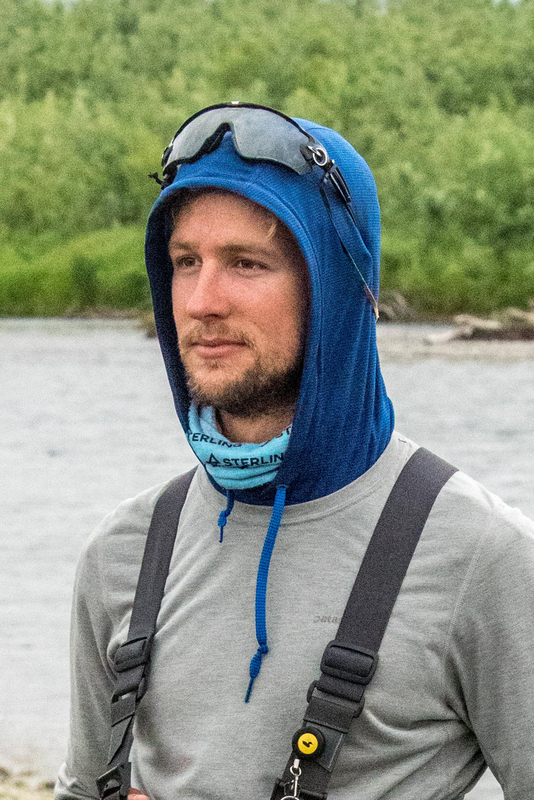 We flew outbound through rain showers to Pegati Lake passing 2 Brown Bears and a Moose, then assembled whitewater rafts and shoved off down the Kanektok. On our minds was the enormity of the travel challenge ahead of us which was: to navigate 100 miles in the 5 days that remained instead of the 7 days we’d planned for. 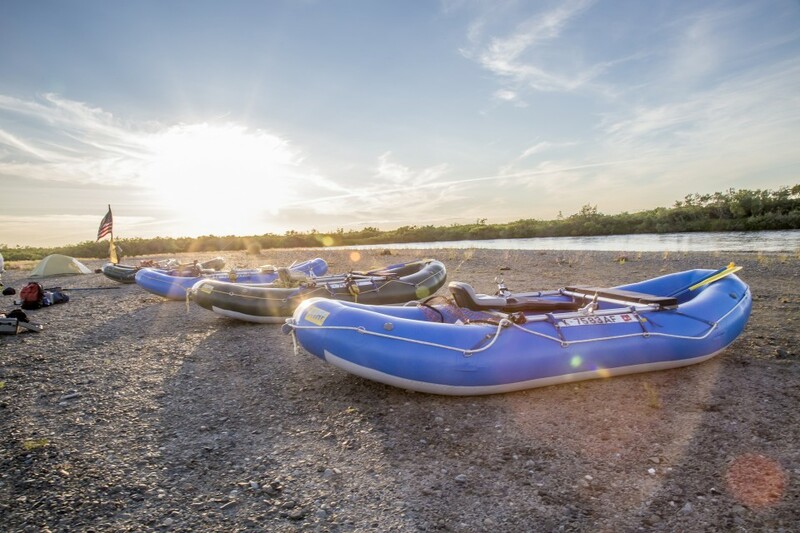 To accomplish today’s goal of making good time to our first camp each of the 4 rafts had 2 Vet paddlers in the bow and an oarsman amidships. 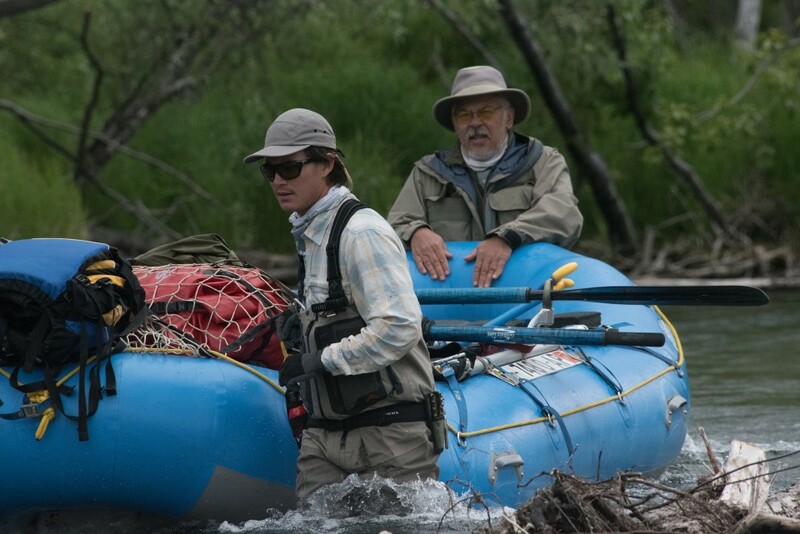 Matt Eischens and Nick Watson shared the paddling with me and we handily made 18 miles to camp 1. As we paddled we listened to the amazing chorus of songbirds, shorebirds and others on there nesting territories. Golden Crowned Sparrows, Greater Yellowlegs and Arctic Terns in particular. We spotted an American Robin at the lake, unusual to see this far west (of the tree-line) in the alpine tundra environment. 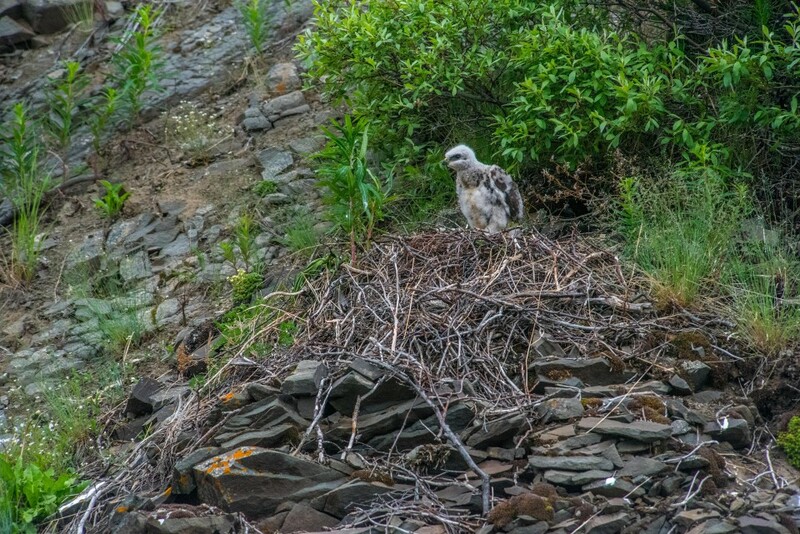 A dark raptor defended her nest on a bluff on river right inhabited by one large nestling. We were unsure if it was a dark Rough-legged hawk or conversely a dark “Harlan’s” Red-tail so we took photos to aid identification later on. Raptor Biologist Bud Anderson later identified it as a dark phase Rough-legged Hawk. We passed a bull Caribou and then the lead boat sighted a Brown Bear. 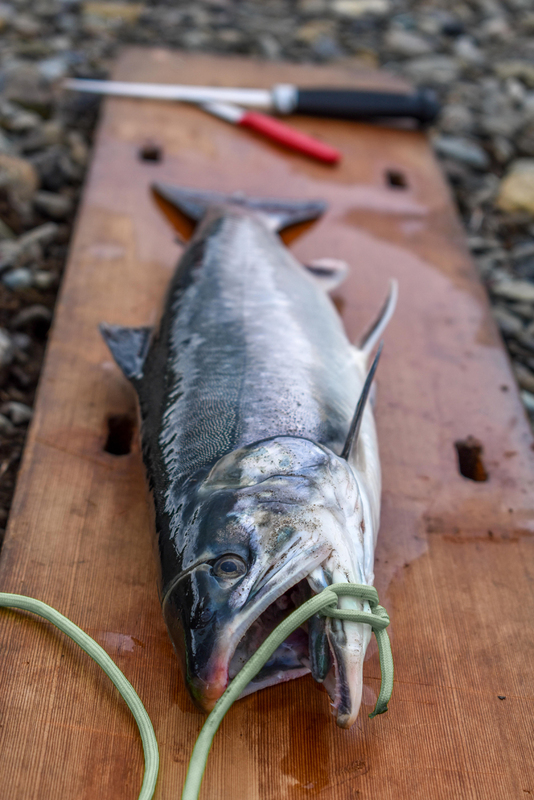 Sockeye Salmon were migrating upriver and a joy to see! We pushed down river hard noting that Grayling were rising to a nice hatch, but we would have to wait for camp before we fished! The Vets crushed it paddling 25 miles which made it the longest distance I’ve ever travelled in a day on the Kanektok river. These guys are strong! 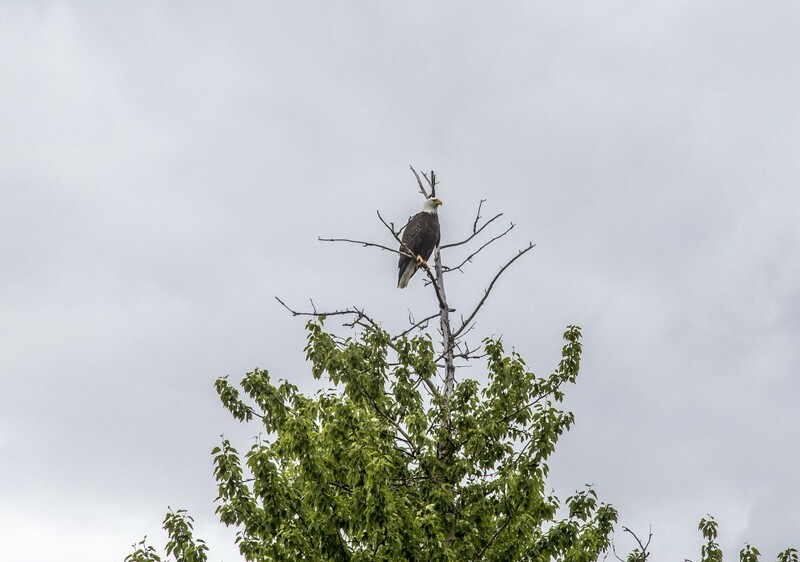 We passed an active Bald Eagle nest attended by 2 adults and spent hours looking into the river at the early run of King and Sockeye salmon. We camped at Falcon Bluff and climbed it for the expansive view. Still broad daylight at 10:00pm the gravel bar was illuminated by low angle sun, which made the wolf, bear, and moose tracks pop out in shaded relief. 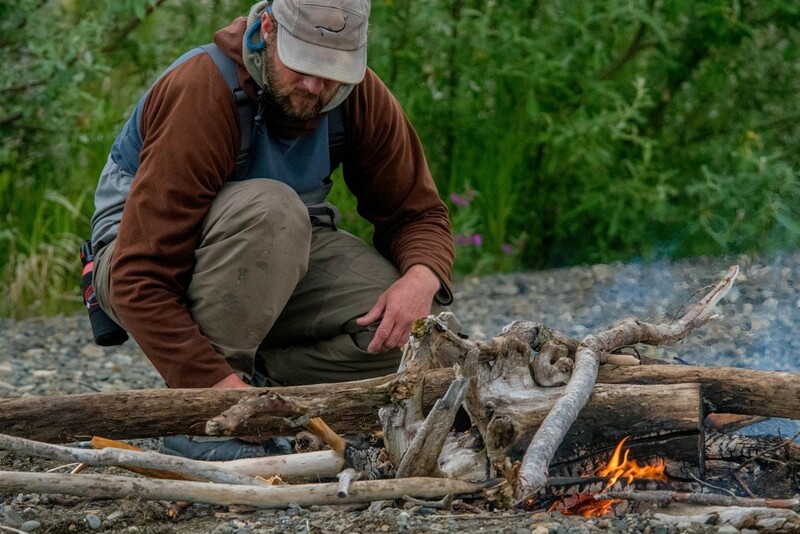 We cast to nice Rainbows, talked of fish caught and those we missed and enjoyed a Sockeye Fish Taco meal riverside. Fog and misting rain, thus no small airplanes were heard today. From Falcon Bluff we fished for 4 hours with nearly continuous Rainbow trout action on streamers with a trout bead just ahead on the leader. Michael Cornelius and Nevin Fowler travelled with me and we enjoyed each passing mile. Bank Swallows had to work really hard hunting midges low over the water in today’s cold weather to earn a living and feed their nestlings. Pairs of Arctic Terns sallied forth and dive-bombed our heads as we passed the gravel bars they nested on. 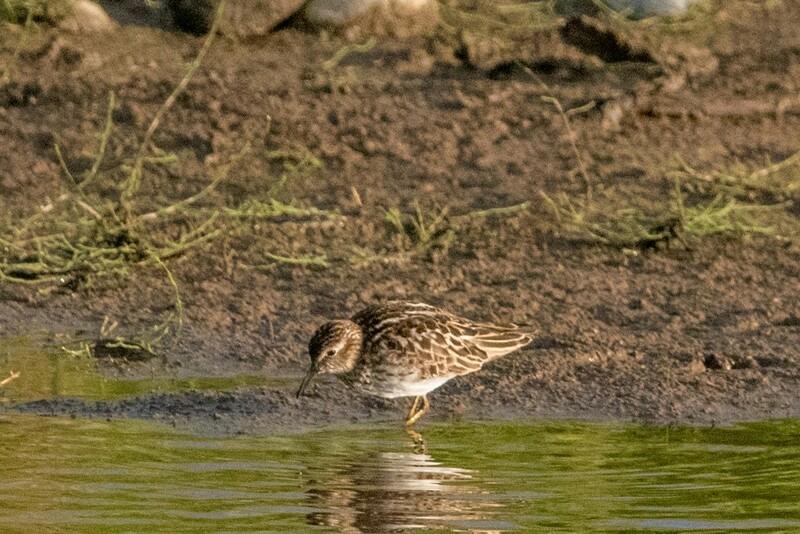 Spotted sandpipers “teetered” in back sloughs foraging for invertebrates. As we passed down river the gravel bars were cloaked in wildflowers, notably “River Beauty” and “Arctic Poppies”. Moose and Wolf tracks traced the sand bars. Drizzle and rain and mosquitoes and great Rainbow Trout fishing. The weather cleared in late afternoon as we chose a gravel bar to camp on. I fished and rafted with Matt and Dan Pond and the fishing was strong enough to keep us eager. Mid afternoon, Matt took a fine male Sockeye. We passed a Gyrfalcon perched in a snag being mobbed by Arctic Terns. Myrtle Warblers sallied forth, hawking emergent aquatic insects as did Bank and Tree Swallows. It interests me that we saw our first 2 Ravens of the trip more than 65 miles down river mobbing a Bald Eagle. In the early summer Ravens are not well distributed in the upper river, probably because there aren’t enough salmon carcasses to feed nestlings. Only in the lower river are Ravens abundant until the young have fledged and the salmon carcasses of August are distributed far upriver allowing them to disperse. Arctic Cotton was blooming in more profusion than I’ve ever seen in this coastal tundra. 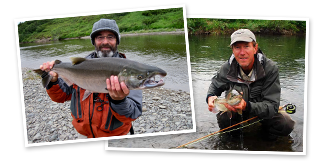 By days end I’d noted that Richard Voss and Michael Cornelia had steadily released trout from their boat all day long. At last count north of 40 were released which made for a good day! The barometer rose steeply overnight and the sky was sun drenched! Every day the team of Vets teaches me something new. Today I learned what a “Woobie” is. It’s a poncho liner and it makes a great warm-up blanket in the cool morning! The relaxed morning in camp was sublime. We fished, and took photos, enjoyed our coffee and chatted. 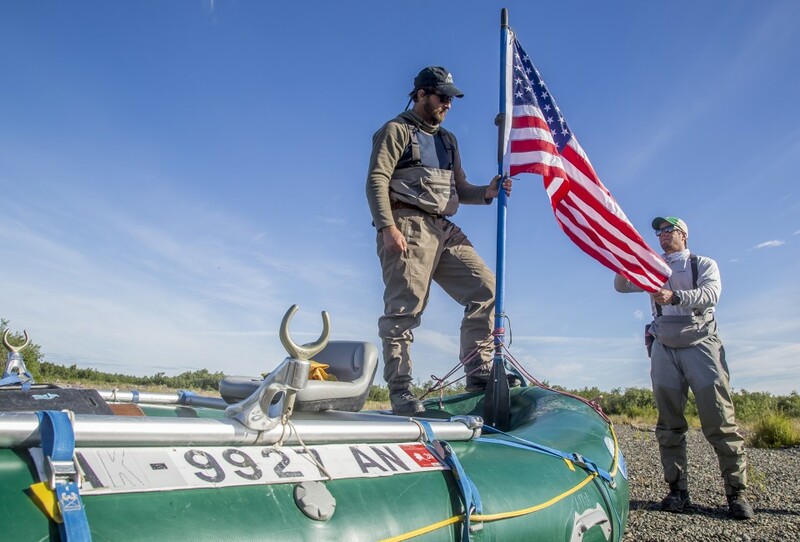 The team raised the American Flag and shoved off downriver with the flag flying above my boat. Richard Voss, a Vietnam war veteran and Randy Pond, a Persian Gulf Vet fished and travelled with me. We took Rainbows steadily and Randy took 2 Chrome Sockeyes, one of which was insanely acrobatic, nearly jumping into the raft. As we passed down river, local boats with families from the Yupik village of Quinhagak motored upriver. They waved and called out “Happy Fourth”. Colleen, the chef at the lower Duncan and Sons guide camp baked us a cake and she along with Gavin & Jacob delivered it by jet sled to camp after dinner. How incredibly thoughtful! 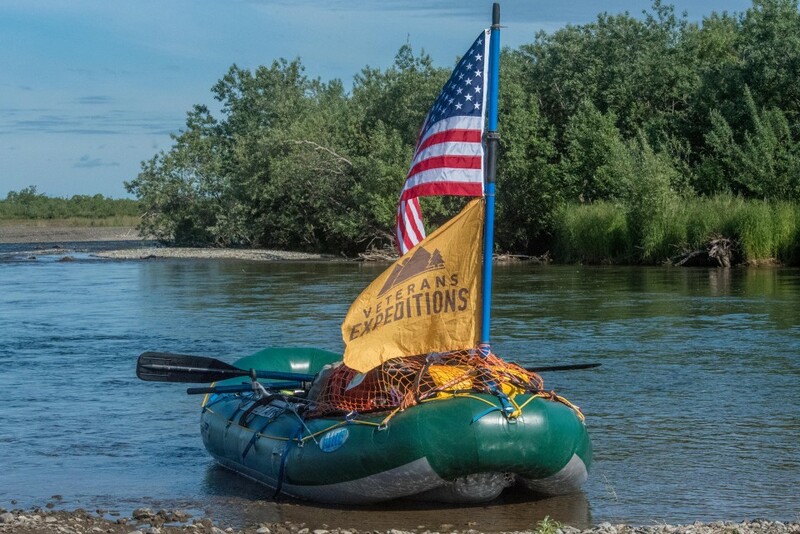 They’d seen us passing down river with the flag and the banner “Veterans Expeditions” and spontaneously whipped up a cake to honor the Vets! The fishing on the 4’Th was typical of the week. 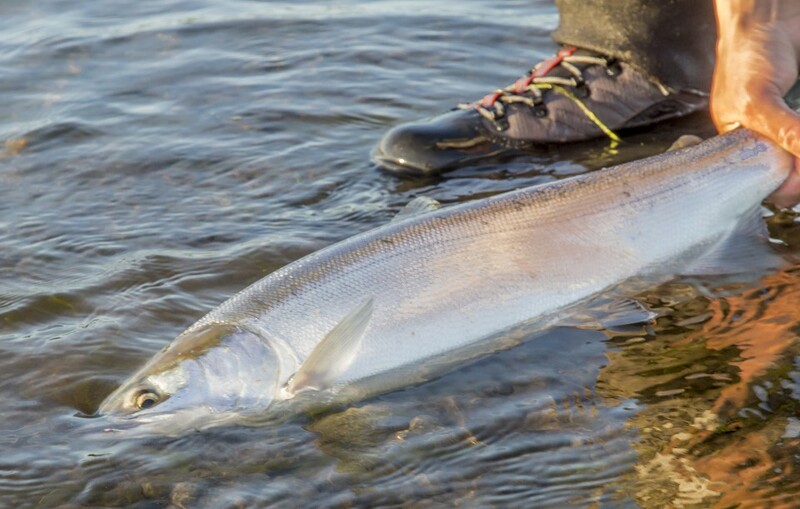 Rainbows were abundant as were Sockeye and Grayling along with a smattering of Chum Salmon and a lovely early season sea run Dolly Varden Char. We thoroughly enjoyed ourselves on our last full day on the river. 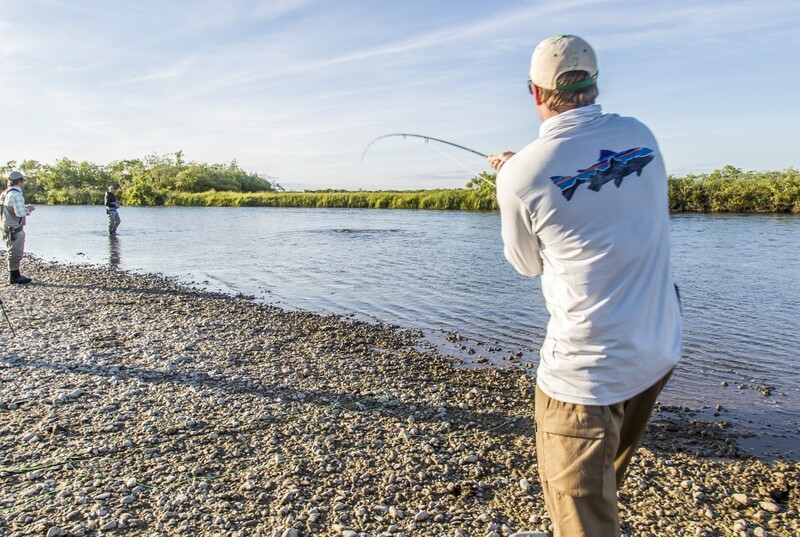 Many Thanks to: John Merritt and Jamie Ferry, The Louis Legacy Foundation, Michael & Christine Curci, and Jim Bean for their generous support of this Veteran’s Fly Fishing program. 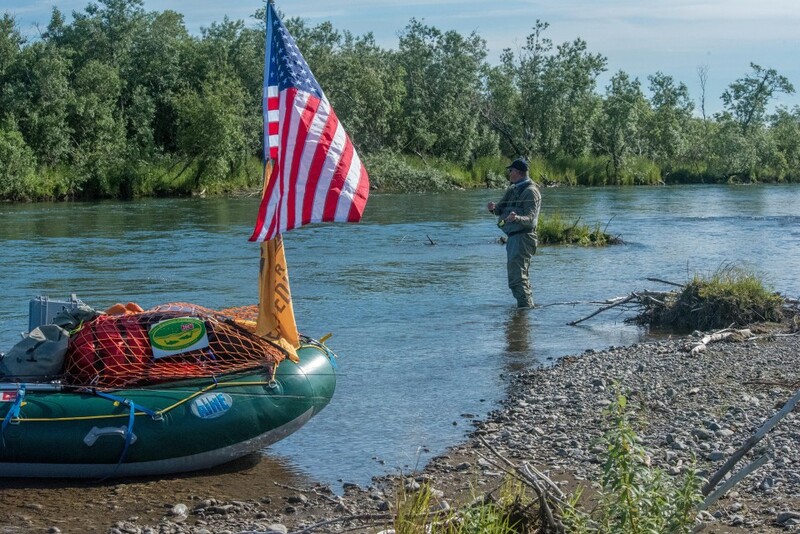 Thank You Richard Voss for your vision to undertake these expeditions with Veterans and disabled anglers. Thanks to this years participants for your terrific “Can do” attitudes, your patience waiting for flying weather, and your love of the outdoors. It was a joy to travel with: Nick Watson, Richard Voss, Nathan Ward, Dan & Randy Pond, Matt Eischens, Nevin Fowler, and Michael Cornelia.